Using Catalogs as Filters - Pitfalls! - Describes some side effects to using catalogs as filters. Visual Studio help systems prior to VS 2010 one could create content filters based on predefined topic meta tags. Selecting a certain filter would restricted TOC, Index & Search results. In such an enormous help system this was an essential part of using MSDN help. While it's true that the first release of Help Viewer 1.x does not formally support content filtering, it does support catalogs and these can be used to filter content. 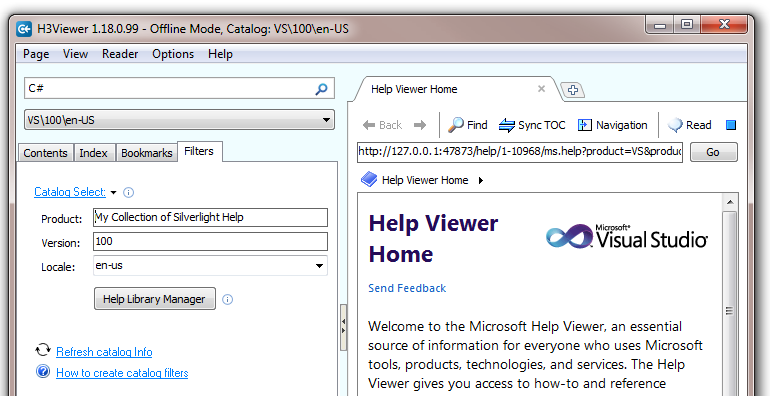 For instance all VS 2010 English Help is installed into the catalog "VS\100\En-us". If you installed content into say "SilverLight Help\100\En-us", you could flip between these catalogs to alter the content displayed and search results. H3Viewer allows you to change catalogs by using the Catalogs dropdown control (marked here with a red box). A Catalog is defined by 3 things: Product\Version\Locale. Visual Studio 2010 English ships a help catalog called "VS\100\En-us". The VS 2010 Russian help catalog is "VS\100\Ru-ru" and so on (for other VS locales see Language and Branding). HelpLibManager.exe is used to add and remove help content for a catalog. HelpLibManager.exe can only deal with one catalog at a time. Help Library Manager is now in a mode where it can only see the "My Own Catalog\100\En-us" catalog books. The H3Viewer Filters page allows you to launch Help Library Manager application in the context of a catalog. Note that when you run HLM, if the specified catalog does not exist, then it will be created and the help-on-help book automatically added. Click the "Catalog Select:" dropdown link to show a popup listing all available catalogs. Click a catalog name (in the popup list) to populate the 3 catalog fields. Optionally enter your own Product name and create a new catalog. Note: At the this time catalogs can be created but not deleted (a limitation of Help Viewer 1.x).